Hazardous material storage is a process that requires consideration and careful planning to achieve safety and compliance measures. Regulations for federal, state, and local agencies are in place to promote safety for workers, the community and the environment. Proper chemical storage is critical, not only for safety, but obtaining the necessary standards protects assets and helps you avoid unwanted hefty fines. Many facilities keep large capacity of chemical storage on hand for manufacturing processes. In this article US Chemical Storage illustrates safe storage tips for storing large quantities of hazardous material storage and regular maintenance to ensure safety. Store incompatible materials separately, including flammables and oxidizers. Certain chemicals, when stored above a certain amount, are to be reported to select officials. Make sure you know whether or not your materials qualify. Signage should be posted on chemical storage buildings and nearby to alert workers and other individuals of hazardous material storage. Store flammable and combustible materials inside fire-rated buildings. Certain materials cannot come into contact with organic materials, (i.e. wood, water etc). Secondary containment sump must contain at least 10% of the total stored liquid volume, or 100% of the largest container of stored liquid volume. Ensure climate controls and mechanical ventilation systems are implemented to rid toxic vapors from inside storage atmospheres. MSDS (Material Safety Data Sheets) should be readily available for the chemicals being stored. Do not block entryways or exits with inventory. Ensure that an Emergency Response Plan is in place for facilities storing hazardous chemicals. Proper bulk chemical storage buildings, as well as mixing and dispensing units, help provide safety to personnel, while meeting federal and local regulations. Chemical storage buildings by US Chemical Storage are uniquely designed to meet specific requirements for storing large capacities of hazardous materials. Compliantly store hazmat inside or nearby existing facilities with fire-rated construction designs. Offering 2- or 4-hour fire-rated constructions for meeting NFPA requirements. 2-Hour Fire Rated Chemical Buildings– allows storage to be placed 10 to 30 feet away from occupied facilities or property lines. 4-Hour Fire Rated Chemical Buildings – allows storage to be placed 10 feet away from or inside occupied facilities. 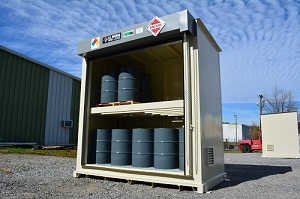 Non-Fire Rated Chemical Building – allows storage to be placed 30 feet or more away from occupied facilities. For more information on large capacity chemical storage buildings, contact us online or call 1-888-294-2729 for a free chemical storage consultation.